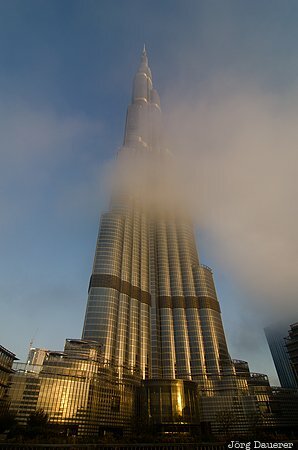 Burj Khalifa (Arabic for "Khalifa tower" - the skyscraper is also known as Burj Dubai) in Dubai is the tallest man-made structure in the world, at 829.8 m. This image shows the Burj Khalifa illuminated by warm morning light and partially covered by wafts of morning mist. Dubai is the Emirate of Dubai, United Arab Emirates (UAE). This photo was taken in the morning of a sunny day in March of 2012. This photo was taken with a digital camera.